Homepage. This page: Can anyone shed more light on this veteran motorcar, built circa 1906?. A Wolseley-Siddeley car from c1906. Francis sent this great old photograph over recently. It features an early Wolseley-Siddeley motorcar, and Francis wonders if anyone could provide any more information on this particular car, the model, where it was used, and perhaps who owned it? Does H-2833 still exist out there somewhere? The photo is believed to have been taken in approximately 1912. There are some interesting details to be found in this image. Note the large folding hood, yet no sign of a windscreen for it to latch on to. The starting handle protrudes out from the nearside of the car, rather than the front, with the chain drive to the rear wheels visible also. The car has two acetylene lamps fitted to the scuttle, yet only one large main lamp up front, on the offside. Is that a single circular lamp fitted to the leading edge of the bonnet, in the centre, or some other motoring gadget? The curvy rear mudguard served two purposes, one to keep mud off the car obviously, but secondly to protect the car's occupants should a chain break and start flailing around. The story of Wolseley motorcars dates back to the late 1800s, when the Wolseley Sheep Shearing Company, whose Works Manager was Herbert Austin, began to take notice of the new-fangled internal-combustion powered motorcars that were beginning to make themselves noticed on the lanes of Britain. In later years he would go on to form his own motor-car factory, but his early motoring involvement began with a self-modified version of the French-built Léon Bollée. His next project while still at Wolseley evolved into the Wolseley Autocar No. 1 of 1897, a three-wheeler with back-to-back seating. It was not a success, and it wouldn't be until 1901 that Wolseley entered serious production of a motor-car for the buying public, this time a four wheeler. 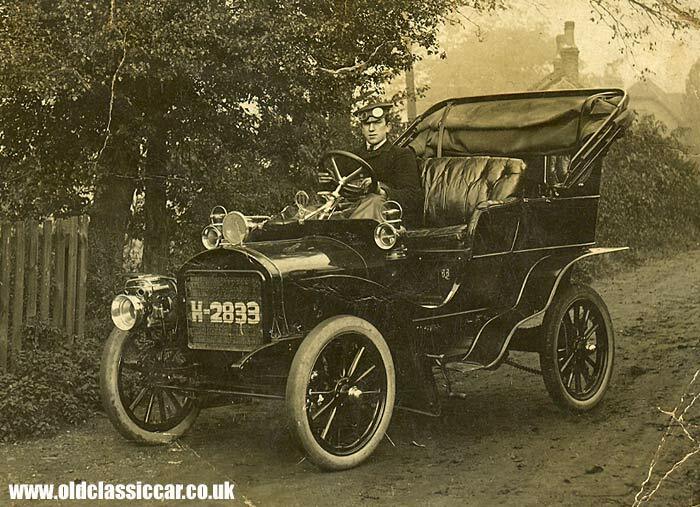 In 1905 Austin left to form this own firm, and shortly afterwards Wolseley bought out the Siddeley Autocar Company. The firm was renamed as Wolseley-Siddeley, and was now under the control of John Davenport Siddeley. The car shown above therefore is probably an early example of a car produced by this manufacturer. J.D.S. stayed with the firm until 1909, then left to join the Deasy Motor Car Manufacturing Co., after which models such as the 12/16 and 16/20 (photo) went on sale. Return to Old Vehicle Photos Page 8.